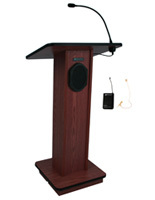 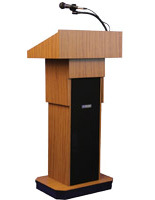 This 50W adjustable column podium w/wired mic is designed for maximum usability as a public speaking or presentation accessory. 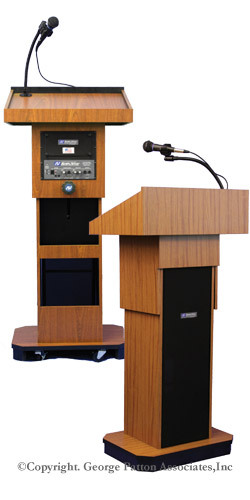 Each wood laminate lectern features a built in sound system with a traditional wired microphone as well as bluetooth/wireless compatibility. 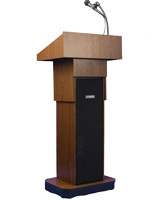 The pneumatic adjustable column podium w/wired mic can be easily set to heights from 39" to 45" tall to accommodate a range of users. 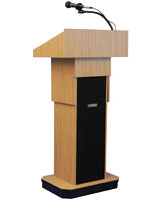 The elegant wood laminate lectern is a perfect accessory for auditoriums, conference halls, convention centers, offices or institutions because of the user-friendly 4-wheeled design. 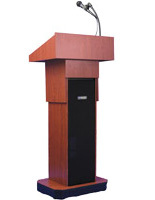 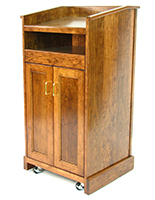 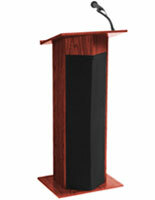 50W adjustable column podium w/wired mic This portable pulpit includes two lockable wheels for stability and safety during use.